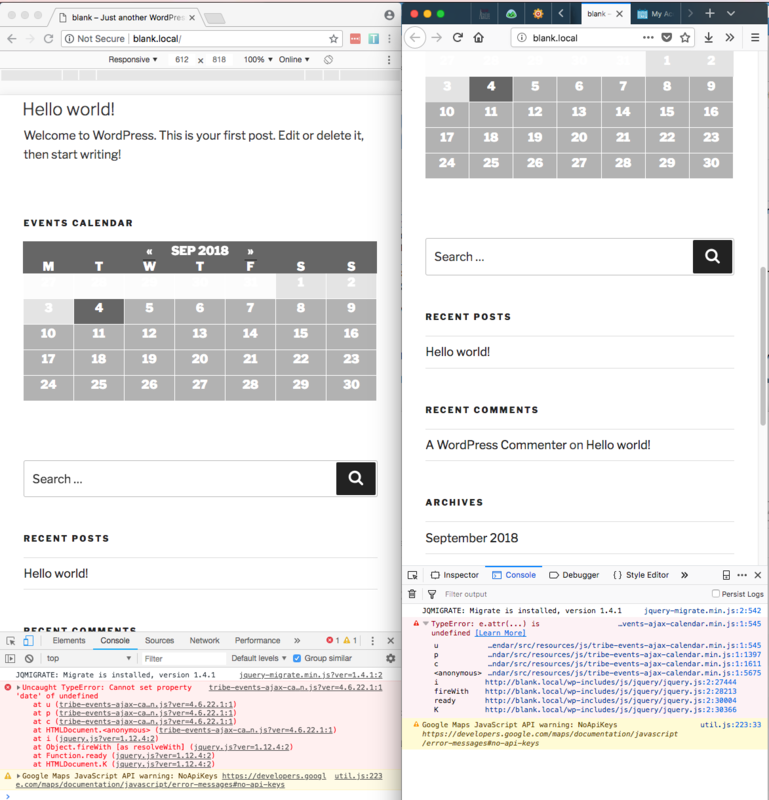 Calendar widget JS error on small screens prevents other plugins from working. Hello, we have a JS error I can’t seem to find a solution to. I’ve looked at our other sites using this plugin and they experience the same issue. After looking at the source code I can’t seem to figure out how to avoid this JS error since it is caused by JS variables not being able to find their target HTML element. 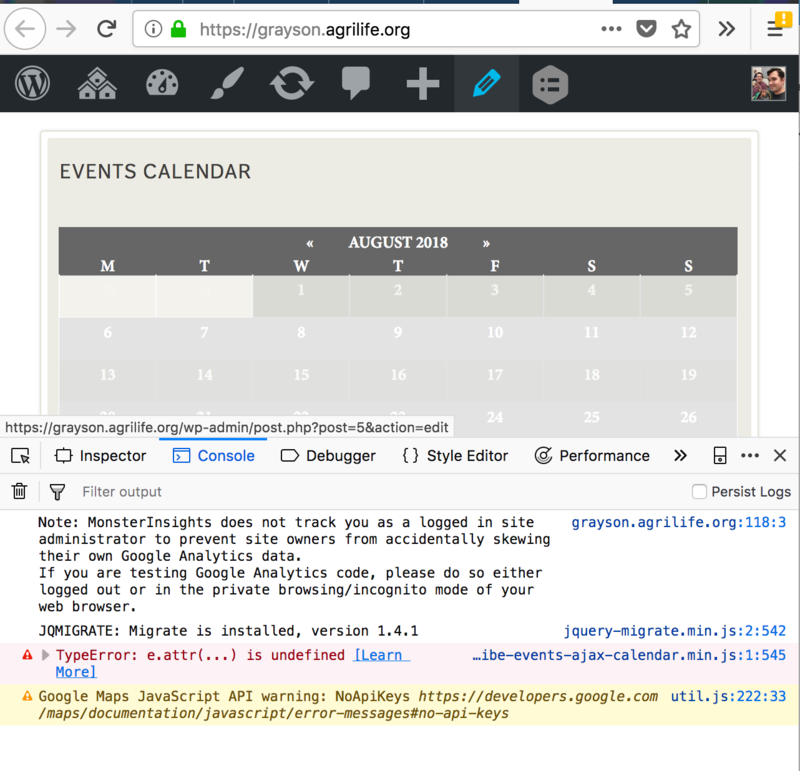 I replaced the minified JS file with the source file (tribe-events-ajax-calendar.js) and the first error is coming from line 155 because $date is undefined. The function is being called from line 201 and I found that the $wrapper variable declared on line 24 wasn’t found on small screen widths. Can you tell me how I can fix this for the dozens of sites we use this on? Is this a problem I’ve caused or does it need to be patched? This topic was modified 7 months, 3 weeks ago by agrilife. I have tried to recreate this on my end, but haven’t succeeded yet. To rule out any conflicts it would also be great if you could go through our conflict testing guide and see if that brings anything to the surface. I tested the latest version of TEC and TEC Pro on a local development site this time with only Twenty Seventeen and those two plugins and I still see the same error. I am testing in Firefox 61.0.2. 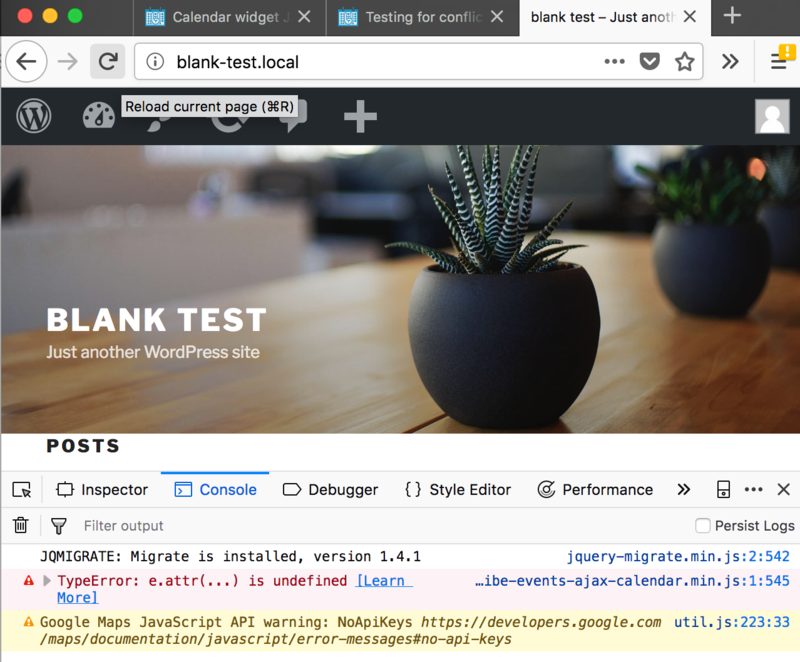 I just did the same, fired up a test site with Local by Flywheel, php 7.1.7 and whatever was default, with Ffox 61.0.2. Installed TEC and PRO and I’m not getting the error you are getting. Not on the home page, not on the calendar page. If I understand correctly you don’t have any other plugins active and there is no caching. Do you get the same with a different browser? What’s your local environment? Server type, php version and the rest? Local environment is Local by Flywheel, PHP 7.1.7 and default settings. Firefox 61.0.2 and Chrome 68.0.3440.106. I’ve attached a screenshot of the error in both browsers. Plugin versions: TEC 4.6.22.1, TEC Pro 4.4.31. No other plugins installed on the local site. I should note that the error occurs when the browser window is about 780px wide or smaller. Ah okay, that explains why I didn’t see it. I see it also with less wide view. It looks like we have a bug on our hand. I will ticket this so our developers can take a look. Ok, how can I get an email once a solution to this issue is published? When the fix goes out we will post a message for you in this thread. If you have opted in to receive email notifications about any new messages here, then you will receive an email as well. The fix should be released next week with the maintenance release if all goes well. Just wanted to give you a ping and check if you have managed to take a look at the update. Hi András, yes the latest update solved our issue! Thanks to your team for fixing this for us! Happy to hear that got fixed! Awesome! Since this is marked resolved I am going to close this ticket, but if you need anything else related to this topic or another please create a new ticket and we’ll be happy to help. The topic ‘Calendar widget JS error on small screens prevents other plugins from working.’ is closed to new replies.